ParentShield SIM cards put Parents in control and provide powerful remote controls of your Child's SIM card. 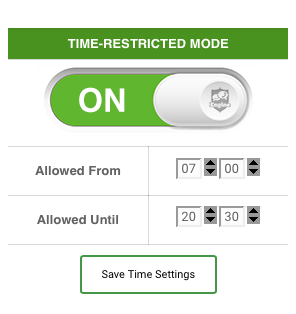 One of the first controls that most ParentShield users turn on is Time Control. This allows you to set a simple time window within which your Child's mobile phone can make or receive calls, sent and receive SMS and use Mobile Data. If your agreed Bedtime is 9pm then it's a simple job from your ParentShield Portal to set this and turn the feature on or off. There is no need to touch the phone so there's no argument. Hopefully, just peace and quiet! At your chosen time ( well, a few minutes afterwards to give a little leeway and account for the possibility of server clocks being a few seconds adrift.) any calls in progress will terminate. Re-dialling will return a suitable message to say that the call will not be possible. To find out more have a look at the Portal Guide. As with all the ParentShield settings that you make in the portal, the actions are instant, taking effect from the very next call or SMS that is transmitted to or from the phone. * Check out the Portal Guide for details of how to turn on Timed Mode. * Negotiate bedtime with your child. Make it fun! * Set the bedtime in the Portal and turn Timed Mode ON. Setting Bedtime with a ParentShield SIM is as simple as it should be.